HONG KONG, Apr 23, 2018 - (ACN Newswire) - Organised by the HKTDC, the 33rd Hong Kong Houseware Fair and the 9th Hong Kong International Home Textiles and Furnishings Fair drew to a successful close today. The two four-day fairs welcomed a total of close to 49,000 buyers from 112 countries and regions, up 1.5 per cent on last year. 29,500 buyers visited the Houseware Fair, while more than 19,000 buyers attended the Home Textiles and Furnishings Fair. Attendance from mature markets such as Singapore, Canada, the UK and the US, as well as emerging markets including the Chinese mainland, Vietnam, Brazil, Argentina and Mexico all saw growth. 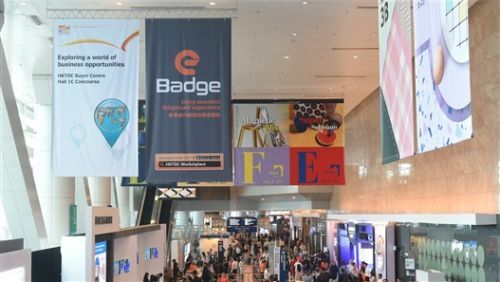 To understand the views of industry players on market prospects and product trends, the HKTDC commissioned an independent on-site survey, interviewing more than 540 buyers and exhibitors at the two fairs. About 60% of respondents expected the ongoing Sino-US trade friction to have no impact on the sector's export performance. The survey also found that the industry is cautiously optimistic about the market's prospects, with 40% of respondents anticipating overall sales to grow and 53% expecting them to remain steady this year. Meanwhile, respondents said the major challenges facing the industry in 2018 are increased operating costs (51%), price fluctuations of raw materials (46%) and the volatility of the global economy (39%). Buyers continue to favour Hong Kong as a trading platform, as the survey found that 46% of buyers polled expect to source an increased volume of products through Hong Kong, while 62% of exhibitors expected to sell an increased volume of products through the city. Quality (87%) and compliance with environmental regulations/standards (83%) were identified by responding buyers as the key competitive advantages of Hong Kong's housewares suppliers. The survey also sought respondents' views on the growth prospects of the major sales markets. Western Europe (72%), Japan (63%) and North America (55%) are the three most promising traditional markets; while the Chinese Mainland (64%) was regarded as the emerging market with the strongest growth prospects, followed by India (46%) and ASEAN countries (43%). In terms of products trends, the respondents said kitchenware and gadgets (15%), eco-friendly products (14%), interior decor and handicrafts (12%) are the product categories with the highest growth potential. Simple designs (45%), multifunction products (42%) and trendy designs (40%) are seen as the most outstanding product styles this year. "Hong Kong has long been a cradle for entrepreneurs," said HKTDC Acting Executive Director Benjamin Chau. "Our innovative thinking and entrepreneurial spirit, which have contributed greatly to Hong Kong's economic success, are crucial for the city's future. 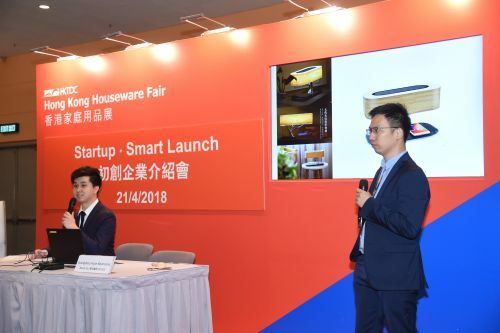 As such, we continued to organise a Startup Zone at this year's Houseware Fair, featuring more than 20 start-ups from Hong Kong, the Chinese mainland, Taiwan and Bangladesh. The zone allowed start-ups to exhibit at a lower cost, making the show a springboard for them to connect with overseas buyers and manufacturers, and a testing ground to gauge market responses to their products. We also organised a number of "Startup, Smart Launch" sessions for start-ups to present their business ideas and explore opportunities." Andy Yeung, Product Designer of local start-up Maxcare Trading Limited. said the Startup Zone provided a cost-effective platform to promote the company's products. "At the fair, our Bicit mini gym bikes, palm-sized massagers, smart ceramic cups and portable air coolers have attracted many buyers, especially buyers from Japan, Taiwan and the US, who will place order for our gym bikes and portable air coolers." The Houseware Fair's main theme this year continued to be "L.I.F.E. ", standing for its four major themed zones: Lifestyle, Interior, Feast and Enrich. Buyers appreciated the effective zoning, which facilitated sourcing. Zubair Ahmed, a buyer from the United Arab Emirates' Danube Home, said that he came to Hong Kong to source home furnishings products for the company's 18 stores. He found six potential suppliers from the Chinese mainland, Japan and Thailand, and finalised orders with four exhibitors for US$250,000 worth of cookware, glassware, cutlery and kitchenware, making his visit rewarding. Held concurrently with the Houseware Fair, the Hong Kong International Home Textiles and Furnishings Fair adopted the "Interior" theme and showcased a variety of home textiles, upholstery and furnishings products, providing a one-stop sourcing platform for buyers. The highlight zone, the Hall of Glamour, spotlighted quality brands and designer collections. India and the Chinese mainland set up a number of dedicated pavilions to showcase their products. Nisha Lamba and Guru Lamba, Directors of Angads Fashion Pty. Ltd. of Australia, visited the fair to source hotel-related textiles and concluded an order for US$25,000 worth of products with an exhibitor from the Chinese mainland. 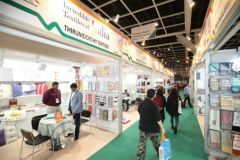 The four-day Hong Kong Houseware Fair and Hong Kong International Home Textiles and Furnishings Fair welcomed a total of close to 49,000 buyers from 112 countries and regions. 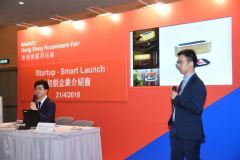 The Startup Zone at the Houseware Fair provided a promotional platform for start-ups, allowing them to exhibit at the fairs at a lower cost and discover business opportunities by presenting their business ideas at "Startup, Smart Launch" sessions. The Home Textiles and Furnishings Fair featured pavilions set up by Indian textiles organisations -- including Handloom Export Promotion Council (HEPC), Export Promotion Council for Handicrafts (EPCH) and Carpet Export Promotion Council (CEPC) -- as well as Nantong city of the Chinese mainland's Jiangsu province, dubbed "the Hometown of Textiles".